The July 20 Pancake Breakfast and June 1 Golf Tournament & Dinner raise funds for the Foundation (501c3). 100% of the proceeds go to scholarships for our Custer County High School graduates. 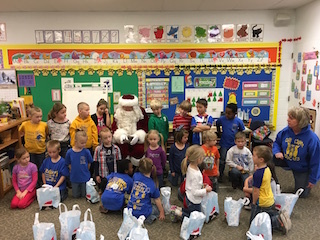 The other fundraisers raise funds with the proceeds going to help Rotary Youth Exchange, Rotary Youth Leadership Program, After Prom, Elementary School Christmas Bags, 3rd Grade Dictionaries, and many other Rotary community projects (see below). 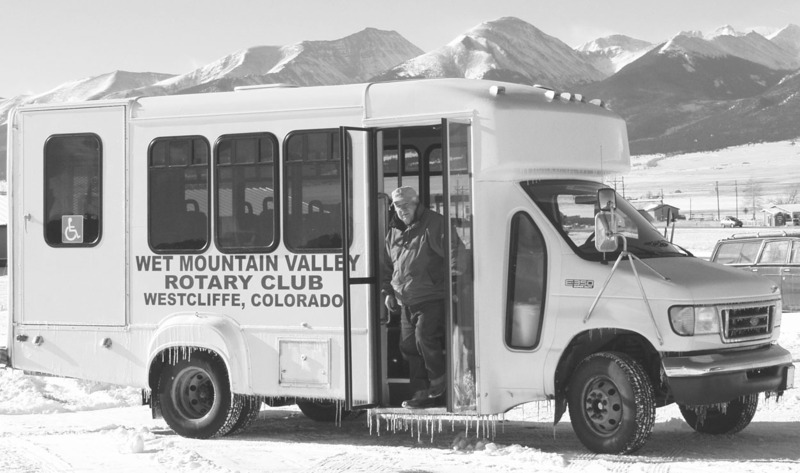 This will be the 31sth year that the Wet Mountain Valley Rotary Foundation has sponsored a golf tournament and dinner to raise scholarship money for Custer County High School seniors in Westcliffe, Colorado. Over the period, thanks to sponsors, we have presented in excess of $500,000 in scholarships to graduating students in our county. Scholarships often determine whether a graduating senior continues their education or not. This years tournament will be held at the beautiful Desert Hawk Golf Course in Pueblo West. The tournament is June 1, 2019, with tee-off at 9 a.m. The Annual Pancake Breakfast will be on July 20, 2019, 7 am - 10 am, 2nd Street (tentative). This is a major fundraiser for the student scholarships, so please come and support the kids and enjoy pancakes and sausage! 100% of the profits go to local student scholarships. The initial idea for the development of Rotary Lending Medical Aids, lnc., came as a need by then former Rotary members, Robyn (Wallerich) Turner and Gene Neiges, collaborating after Turner had an auto accident and was recuperating at home. The lack of durable medical goods within the community was quite evident. Gene Neiges' memory of past years, when his teenage daughter was recuperating from an auto accident, was of an organization called The Three Village Garden in New York provided much of the needed medical equipment (wheel chairs, beds, etc.) for the community. 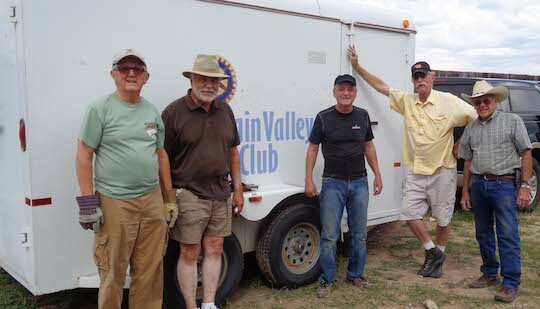 After a brief discussion, the idea to have the Wet Mountain Rotary Club sponsor an organization to provide the community with needed medical equipment was set into motion. For more on the history, click on the image. This is a transportation provided to Valley residents to assist them with trips to visit doctors or run special errands. Most of the people in the transportation business did not believe we could run our project with just volunteers. but that is exactly what has happened. We have drivers from the Rotary club and drivers from the community volunteer their time. Many drive more than once a week taking people to Pueblo, Canon City, Colorado Springs, Salida, as well as Westcliffe. For more history on the service, click on the image to the right. 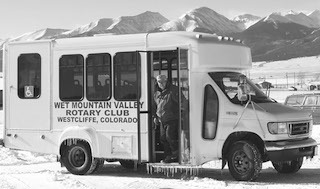 Rotary Van Service from 2004 (click o the picture for a larger image). Other local projects include giving dictionaries for all 3rd Grade students, Christmas gift bags to local seniors and shut-ins, support for the Summer Youth Jazz Camp, parking assistance for summer programs, ticket collection for school activities, tent and table rental, and other small projects for the community. We also send Santa Claus with special gifts for local school children. Be sure to view all the photos in the Gallery! We are involved in many other projects. Go to the Calendar page for the next fundraiser.